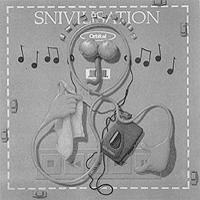 Snivilisation is the third studio album by English electronic music duo Orbital, released on 23 August 1994 by FFRR Records. The album peaked at number 4 on the UK Albums Chart, and had sold over 80,000 copies in the United Kingdom by April 1996.. The band released the album at the time of the launch of the Criminal Justice Act, the legislation that gave British Police greater legal powers to break up unlicensed raves that gave Orbital its name. The Are We Here? single featured the track "Are We Here? (Criminal Justice Bill? )", four minutes of complete silence. "Philosophy By Numbers" samples Sidney Stratton chemistry experiment from the film The Man in the White Suit. "Are We Here?" samples a part of "Man At C&A" by The Specials. Track's vocals by Alison Goldfrapp, as on "Sad But True". "Are We Here?" is also on Work 1989-2002. The album was included in Q magazine's "The 25 Best Dance Albums Ever" in October 1997. It also made Q's end-of-year top 10 best albums list in 1994. It is also featured in the book 1001 Albums You Must Hear Before You Die. ^ Bush, John. "Snivilisation – Orbital". AllMusic. Retrieved 18 October 2011. ^ "Orbital: Snivilisation". Q (97): 122–24. October 1994. ^ Randall, Mac (2004). "Orbital". In Brackett, Nathan; Hoard, Christian (eds.). The New Rolling Stone Album Guide (4th ed.). Simon & Schuster. p. 607. ISBN 0-7432-0169-8. ^ Maconie, Stuart (August 1994). "Orbital: Snivilisation". Select (50). ISSN 0959-8367. Archived from the original on 23 May 2009. Retrieved 22 May 2009. ^ "Orbital: Moving into the Mainstream". Music Week. London, England: United Business Media. 20 April 1996. p. 21. ^ "The 25 Best Dance Albums Ever". Q. EMAP Metro. October 1997. ISSN 0955-4955. Retrieved 18 October 2011. ^ "Recodings of the Year: Top 10". Q. EMAP Metro. 1994. ISSN 0955-4955. Retrieved 18 October 2011.